Slow and disappointingly retro, not a series highlight. What is it? Perennial spreadsheet shuffling management game. Reviewed on Nvidia GTX 570, Core 2 Quad Q6600, 8GB RAM. Last year I played Football Manager 14 in ‘classic mode’, the faster, more streamlined version of the game. Going straight from that to a full game of Football Manager 15 is like sprinting headlong into a wall of molasses. Football Manager is often billed as ‘the football RPG’: selling the feeling of a manager’s life as much as the strategy game built around it. It’s one of those ideas that sounds fantastic on paper, but every time Sports Interactive try and embrace the idea, they just end up adding more press conferences. Press conferences are to Football Manager what Desmond is to Assassin’s Creed. No-one likes them, no-one wants them, but SI keep trying to make them work. Now there are also tunnel interviews and lots more player conversations, all of which involve answering a series of questions and selecting a tone (assertively, calmly, passionately) and all of which take far too long. Things taking too long is a theme the theme of this year’s Football Manager. Scouting players now takes several attempts, during which their attributes are displayed as a range (eg: 10-15) that you gradually narrow down. It’s a totally unnecessary time sink. I spent two solid months researching duff right wingers before eventually giving up and googling for one, which lead me to the excellent looking Andrija Zivkovic in a fraction of the time. This is how most FM fans actually play, but instead of embracing this level of meta-knowledge, SI are acting like it doesn’t exist. But it’s hard to condemn the game for these irritations, because they all disappear the moment you flip over to good old classic mode. Scouting is instant, press conferences are kept to a minimum and unimportant matches can be resolved instantly. Classic values your time and gives you the tools to shortcut to the fun stuff. Of course if you do play that way then you’ll find the game is almost identical to last year’s edition, bar two crucial changes: the UI and the match engine. The UI is a genuine improvement. It’s not only pretty, but includes some smart decisions. Some changes are clear reactions to how players use the game, like moving the much used quicksearch bar front and centre, while others try subtly influence them, like combining the player search and scout sections to encourage you to use your staff. Veteran players may chafe at having to unlearn years of bad habits but trust me, it’s worth it. The bigger problem is the match engine. Criticising it is a dicey business. The way it works is so deliberately, wonderfully opaque that players tend to treat it like a force of nature rather than something that has ever actually been designed. But there’s a significant pattern to this year’s efforts: crosses are everything. Target men and traditional wingers are in vogue in a way not seen since the early 2000s. Get enough balls into the box and you will probably win. I’d say two thirds of my goals came from crosses, and the rest from long balls over the top. Short passing got me absolutely nowhere. Now you, dear reader, may love long ball football, you may delight in old fashioned wing play. 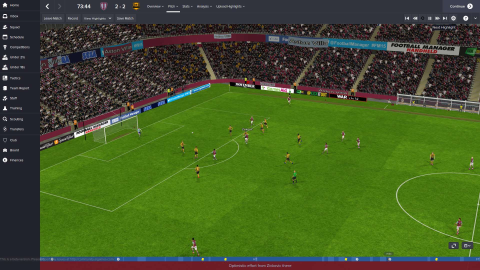 If you do, you’ll probably like FM15’s decidedly retro approach. But it does seem a bit strange in a world where all the major teams are all using inverted wingers and diamond formations for old fashioned touchline hugging wingers to be so dominant. I started the game fantasising about being Brendan Rodgers or Joachim Low, but I ended up playing like Tony Pulis. At its best, Football Manager reflects the state of modern football, but these tactics are straight out of 1998. Contrast this to FM14, where players were playing gorgeous passing football and experimenting with avante-garde strikerless formations while holding discussions about ‘verticality’. FM14 was the football of coffee house intellectuals, FM15 plays like a lager lout. Football de-arte isn’t everything, but after a few hours of FM15’s muscular physicality I found myself longing for the silky skills of my old Everton team. This all might sound overwhelmingly negative, so it’s important to stress that the basics of Football Manager are still there and working as well as ever. Football Manager 15 is still a good game, especially when played on classic, and you won’t go far wrong if this is your first game in the series. But for existing fans there aren’t a lot of compelling reasons to upgrade from last year’s edition, unless you’re really nostalgic for the Graham Taylor approach to football. Of course it’s entirely possible the traditional mid-season patch will change the tone of the match engine completely, at which point I’d heartily recommend it. But for now at least, this is a year to miss.